Welcome to the original and largest event for expecting and new parents! Learn about and demo all the latest baby products on the market and learn from the experts and other new parents about what to expect. ALL attendees receive full access to the show floor, lounges, samples, seminars, and the chance to win prizes like strollers, carriers and other baby gear. Be sure to join our Facebook Event page to see the most updated list of companies, panelists, and other event news! Purchase your tickets early as quantities of our signature Goodie Bags are limited! Networking: Our events bring together thousands of expecting and new parents across the country and are a great way to meet people in the same life stage right in your own city. Lifelong friendships have formed at our events so don’t be shy to hi to fellow attendees! FUN! 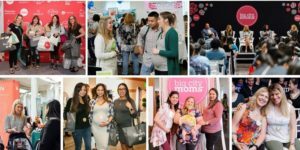 Big City Moms and our partners have worked hard to make sure you enjoy a fun evening of product sampling, education, lite bites, raffles, and prizes with your partner, friends, family and the entire Big City Moms community! What is the difference between the Ultimate and General Admission Passes? Can I bring my partner / friend / family member? Absolutely! The more the merrier and there is plenty for everyone to see. Please take advantage of our special couples ticket pricing. It’s also helpful to have an extra set of hands to help carry all the gifts and samples you will get! Unfortunately, due to fire hazard policies at our venues, strollers are NOT permitted. Who receives the Goodie Bag and what is in it? Goodie bags are available as an add on purchase to any ticket type. The Goodie Bag is comprised of full size products as well as samples, food treats, and some coupons. Can I return or exchange products in the Goodie Bag? No. All products and coupons in the Goodie Bag were generously provided by our sponsors and cannot be returned or exchanged. If I can’t make the event, how can I get my Goodie Bag? You MUST pick up your Goodie Bag on event day or arrange for a friend or family member to pick it up for you. Any Goodie Bags not claimed by the end of the event will be foregone. YES! Many companies will hold individual contests at their tables. Please note: these contests are not managed by Big City Moms – therefore anything won or any prizes uncollected from the contest should be worked out directly with the company. Big City Moms will not be held responsible for defective or uncollected winnings.